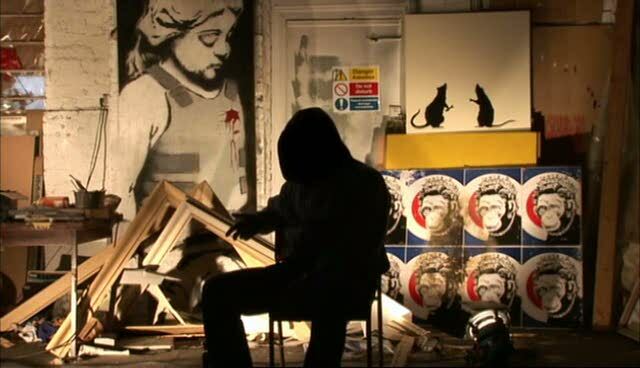 Noted British street artist Banksy’s Exit through the Gift Shop (2010) is a confounding beast in that it purports to be a documentary by Banksy on a man called Thierry Guetta who attempts to make a documentary on Banksy (along with other street artists). The first section of the film brings us the essence of street art, its intention to democratize art by bringing it out of arthouses and into the streets. (One of Banksy’s “guerilla installation” works depicts a lady wearing a gas mask). Gradually, the film’s focus shifts to Guetta himself. He is presented as an inarticulate, passionate camera buff fetishizing the recorded image (presaging his unrestrained fetishizing of pop culture later on), as a romantic who believes that recording every moment of one’s life increases the value of one’s gaze and, in a sense, as a Banksy-like artist working on the streets of life. Along the way, it takes a lot of potshots at the reception of avant-garde art centered on the grand debut of Guetta. The interesting thing here is that it doesn’t judge Guetta’s works till the very end, thereby toying with our perception of these works as well (some of them indeed seem praiseworthy and were probably made by Banksy himself). But then, Exit does have an agenda of its own. It evidently stands against celebrity culture and the commodification of street art. It seems to propose that street art has to be a physical endeavour more than a conceptual one and that the physical presence of the artist during creation is of utmost importance. Ironical it is that Banksy himself has held a number of exhibitions and is a revered name in art circles. This is perhaps the whole point of the film. Exit could be read – if not as a self-serving promotional campaign – as Banksy’s attempt to come to terms with his failed anonymity, as an effort to resolve the contradictions associated with his name (through the figure of Guetta) and as a form of self-criticism which recognizes that he has become a brand despite himself. It is interesting to think of the Guetta exhibition in Los Angeles as a large-scale, covert, calculated installation work by Banksy in the spirit of his infamous Disneyland adventure (or a sick joke if you prefer). Excellent delineation here JAFB! Although the critical establishment has praised this film to the high heavens, I didn’t see any enlightenments and found the film (oddly) distancing and uneven. Perhaps it’s partially because of what you seem to imply here – a mistaken identity. In any case, for all sorts of provocative reasons, JEAN-MICHELE BASQUIAT: THE RADIANT CHILD resonates far more intimately. I haven’t seen THE RADIANT CHILD. I’ll take that as a recommendation from a film savant! Thanks, JAFB for a neat dissection of the film – I wish I could get my waffly reviews down to a similarly succinct scale. Confirmation, a lie, part of the fabrication? Beyond this sport, and the fascinating footage of street artists at work, I don’t think it taught me anything about art as such. I’m not interested if it wants to dismiss art fans as gullible, fatuous navel-gazers (I’m not convinced that’s what it’s saying), which is the default setting of even the mildest critiques of the art world. If nothing else, it made art seem like a lively, creative and exciting thing, and by taking the tired question “but is it (an) art(ist)?” and stretching it out into a feature-length guessing-game, it held my attention. Excellent points there, Dan, that concur with my own opinion. It sure does take some potshots a ag-art (specifically our response to them), but it does not muck about and goes on to something more substantial. I guess it’s central point is about the arthouse-ization of street art. But it really doesn’t stick to that single point all the way either. I still believe there would be sufficient evidence from within the film itself to prove Guetta is a fake. But that post makes a pretty strong case against that.